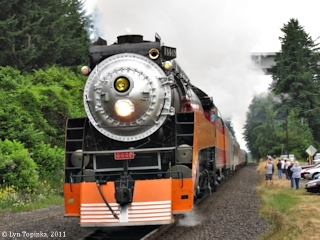 "SP 4449 ... July 2 and 3, 2011"
Click image to enlarge SP 4449 Steam Engine, heading east to Wishram, as seen at the Vancouver Trout Hatchery, east of Vancouver, Washington. 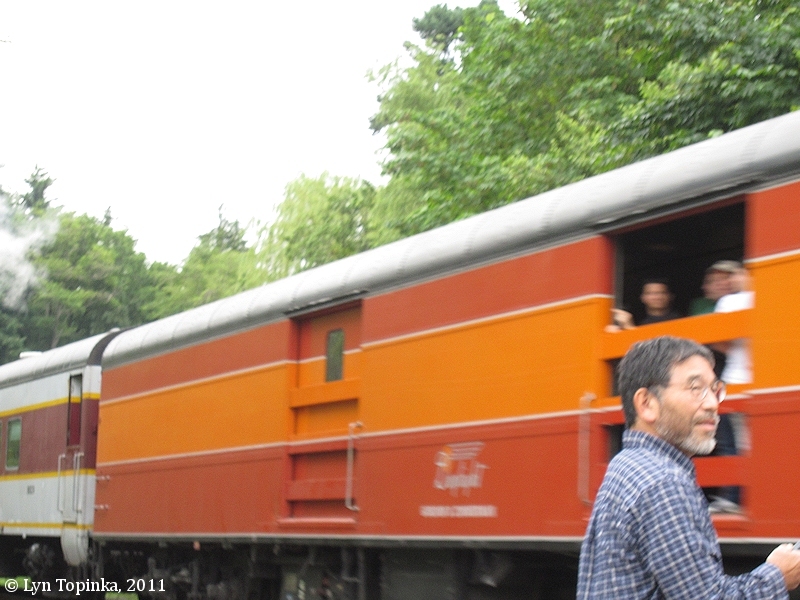 Image taken July 3, 2011. Viewpoint is from Vancouver Landing looking west towards the Vancouver railroad bridge crossing the Columbia River at River Mile (RM) 105.5. 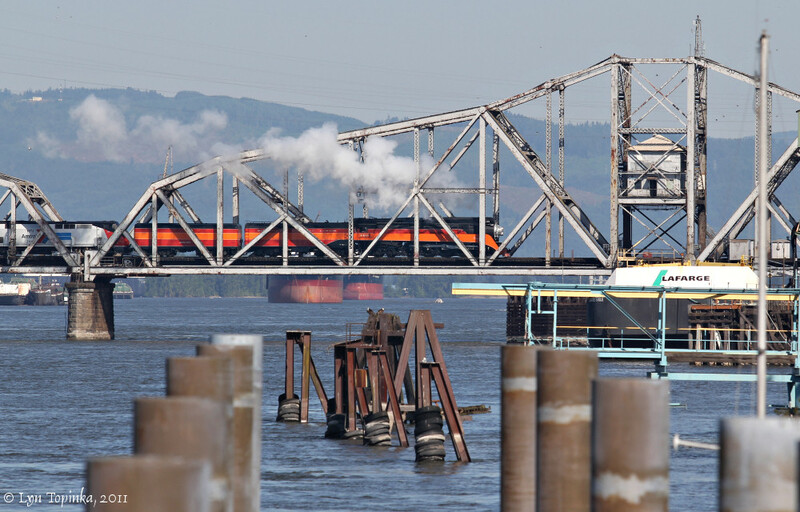 Click image to enlarge Closeup, SP 4449 Steam Engine crossing the Columbia River, from Hayden Island, Oregon, to Vancouver, Washington. View from Vancouver Landing. Image taken July 2, 2011. 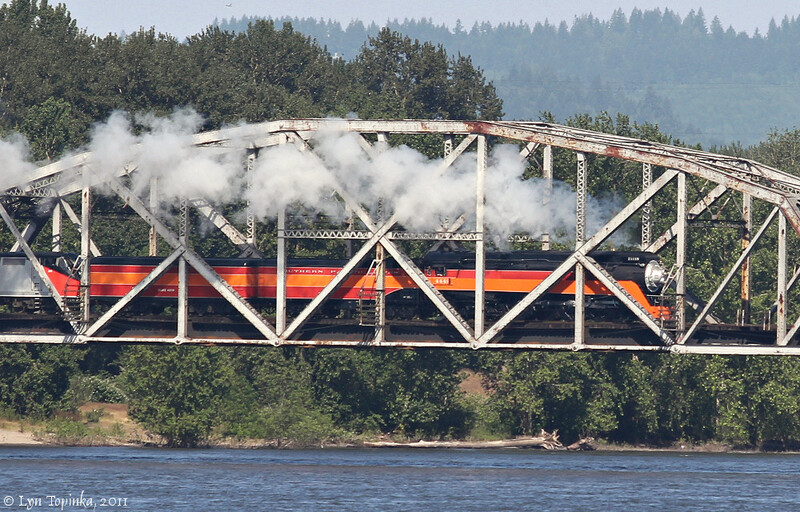 Click image to enlarge SP 4449 Steam Engine approaching Vancouver. Image taken July 2, 2011. The Vancouver end of the railroad bridge swings to allow river traffic to pass. View (and foreground pilings) from Vancouver Landing. I tried to "chase" the SP 4449 and beat it to the Vancouver Trout Hatchery, 8 miles upriver. However, I should have scouted out my roads beforehand !!! ... I not only missed the turn to get onto Washington State 14 (the fastest route) but instead chose Evergreen Highway ... unknown to me, Evergreen Highway had SPEED BUMPS on it !!!!!!!!!!! ... the SP 4449 beat me to the Vancouver Trout Hatchery by seconds. 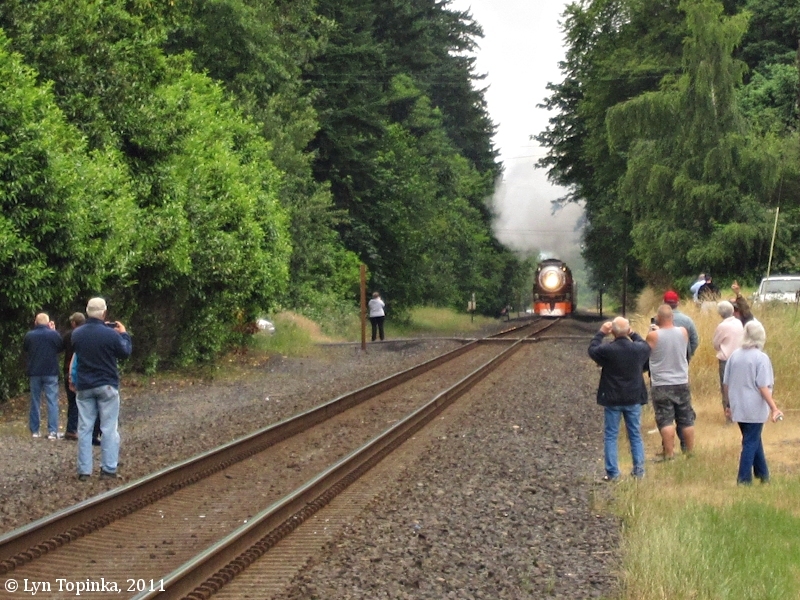 Click image to enlarge SP 4449 Steam Engine beating me to the Vancouver Trout Hatchery. View from front window of car. Image taken July 2, 2011. Viewpoint is on Evergreen Highway at the Vancouver Trout Hatchery, at Columbia River Mile (RM) 113. 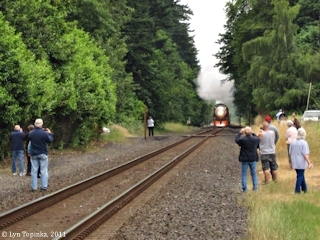 Click image to enlarge SP 4449 Steam Engine, heading east to Wishram, as seen approaching the Vancouver Trout Hatchery, east of Vancouver, Washington. Image taken July 3, 2011. Click image to enlarge Baggage car, SP 4449 Steam Engine, heading east to Wishram, from the Vancouver Trout Hatchery, east of Vancouver, Washington. Image taken July 3, 2011. 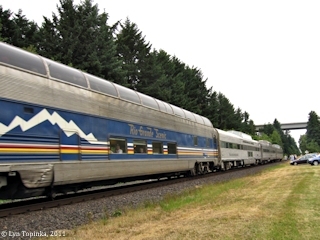 The baggage car has wide doors for riders to view from to enjoy the Gorge. 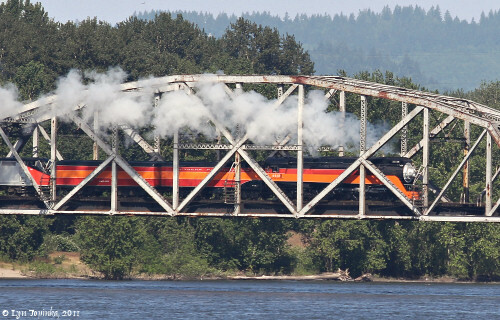 Click image to enlarge "Rio Grande Scenic", SP 4449 Steam Engine, heading east to Wishram, from the Vancouver Trout Hatchery, east of Vancouver, Washington. Image taken July 3, 2011. 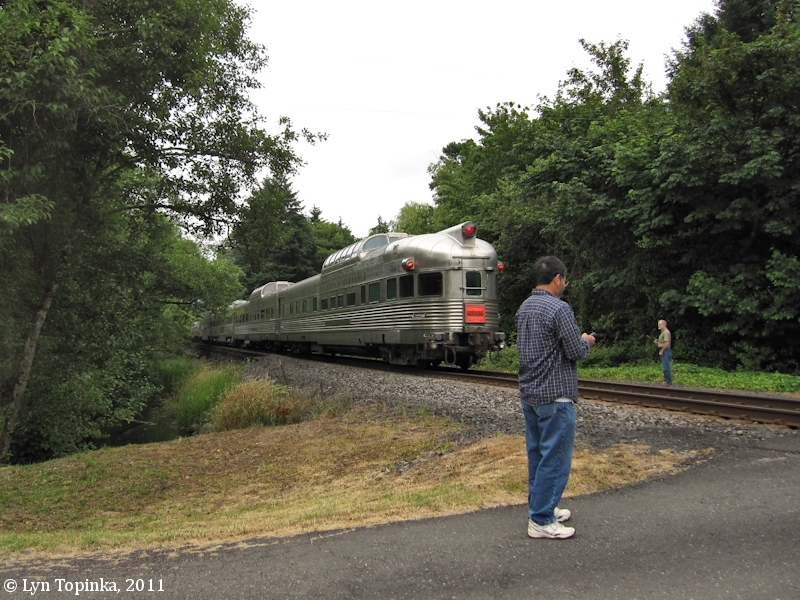 Click image to enlarge "California Zephyr", SP 4449 Steam Engine, heading east to Wishram, from the Vancouver Trout Hatchery, east of Vancouver, Washington. Image taken July 3, 2011. "... Built in 1941 as a 4-8-4 GS-4 "Northern" type locomotive, she is 110' long, 10' wide and 16' tall. With locomotive and tender weighing 433 tons and a boiler pressure of 300 psi, her eight 80" diameter drivers and unique firebox truck booster can apply 5,500 horsepower to the rails and exceed 100 mph. Retired to Oaks Park in 1958 for display only, in 1974 she was completely restored specifically to pull the 1976 Bicentennial Freedom Train throughout the United States to the delight of over 30 million people. 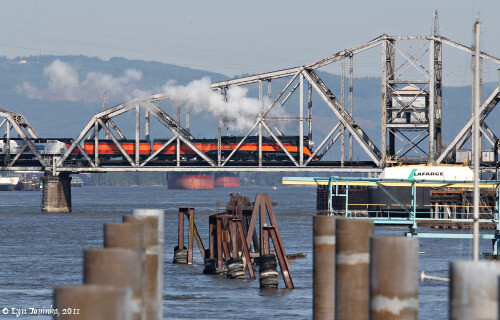 The only remaining operable "streamlined" steam locomotive of the Art Deco era, this grand Lady of the High Iron pulled Southern Pacific "Daylight" coaches from Los Angeles to San Francisco over the scenic Coast Route and then on to Portland until 1955. She is arguably one of the most beautiful locomotives ever built -- and kept that way by the all-volunteer Friends of the SP 4449. ..."
In September 1999, the Southern Pacific "Daylight", the train 4449 was built to pull, was commemorated on a U.S. Postage Stamp.